Figure 1. Burracoppin Project location. In January 2017, Bullamine Magentite Pty Ltd, a wholly owned subsidiary of Reedy Lagoon, lodged an application for an exploration licence covering its previous Burracoppin Magnetite Prospect located near Merredin about 250 kilometres east of Perth in Western Australia. Reedy Lagoon held the Burracoppin Magnetite deposit when it was discovered in 2012 with its then joint venture farm-in partners: Cliffs Magnetite Holdings Pty Ltd (manager), NS Iron Ore Development Pty Ltd and Sojitz Mineral Development Pty Ltd. The farm-in parties withdrew in 2014 and Reedy Lagoon relinquished the ground in April 2016. Magnetite mineralisation in multiple bands with variable continuity was intersected by drilling in 2012 by our previous joint venture. Additional drilling is required to better understand the extent of the mineralisation. However, the limited drilling completed indicates the mineralised bands have combined horizontal widths of between 150 metres and 200 metres. Detailed magnetic data indicate a strike length of 3,000 metres and a potential tonnage of magnetite bearing rock of between 140 and 220 million tonnes (refer to ASX release 31 January 2013). 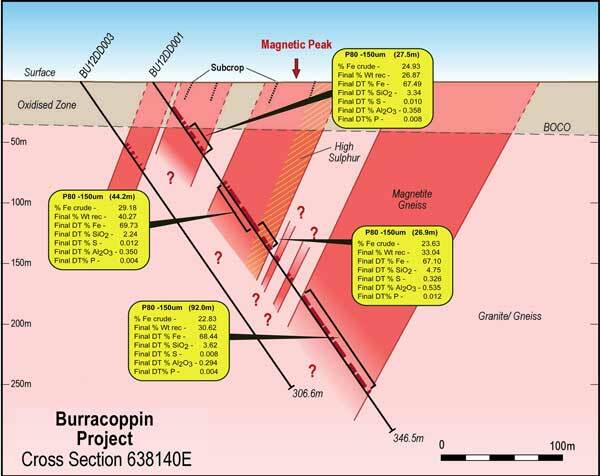 Note that the potential quantity and grade of the Burracoppin deposit is conceptual in nature. There has been insufficient exploration to define a Mineral Resource and it is uncertain if further exploration will result in the determination of a Mineral Resource. Metallurgical studies on core samples have produced concentrate with high iron levels (67% to 70% Fe) and low levels of impurities at a relatively coarse grind size (P80 -150 micron) (refer to ASX release 23 November 2012). Figure 2. Burracoppin project (KEL4). The target magnetic anomaly in detailed magnetic survey (airborne at 50 metre line spacing) showing 2012 drill holes. Magnetite mineralisation in multiple bands with variable continuity has been intersected by drilling in 2012. Additional drilling is required to better understand the extent of the mineralisation. However, the limited drilling completed indicates the mineralised bands have combined horizontal widths of between 150 metres and 200 metres. Detailed magnetic data indicate a strike length of 3,000 metres and a potential tonnage of magnetite bearing rock of between 140 and 220 million tonnes. Note that the potential quantity and grade of the Burracoppin deposit is conceptual in nature. There has been insufficient exploration to define a Mineral Resource and it is uncertain if further exploration will result in the determination of a Mineral Resource. Metallurgical studies on core samples have produced concentrate with high iron levels (67% to 70% Fe) and low levels of impurities at a relatively coarse grind size (P80 -150 micron) (2012). Figure 3a. Burracoppin Project section 638650E for diamond drilling completed to end September 2012. Results are for composite samples over the intervals stated. The metallurgical data has been reported by BV Amdel, an independent laboratory in Perth. Figure 3b. Burracoppin Project section 638140E for diamond drilling completed to end September 2012. Results are for composite samples over the intervals stated. The metallurgical data has been reported by BV Amdel, an independent laboratory in Perth. Table 1. Metallurgical results from diamond drilling completed at the Burracoppin project (September 2012). Results are for composite samples over the intervals stated. The metallurgical data has been reported by BV Amdel, an independent laboratory in Perth. Figure 4a. The Burracopin metallurgical results can be compared with results at other magnetite deposits in Australia (the coarser the grind size to achieve high Fe content and low SiO2 content, the better). Figure 4b. The Burracopin metallurgical results can be compared with results at other magnetite deposits in Australia (the coarser the grind size to achieve high Fe content and low SiO2 content, the better). The graphs above show Davis Tube Recovery (DTR) concentrates of several Australian magnetite projects plotted against grind size information sourced from public documents. Graph A shows iron grades and Graph B shows silica. Typical cut-off grades for commercial grade products are shown by the horizontal dotted lines - minimum 65 % iron and maximum 5 % silica. Preliminary metallurgy for the Burracopin Project shows good comparison to other projects at a coarser grind size than is typically achievable. Coarser grind size means lower production costs and potentially better product prices. Notwithstanding the potential for production of a premium sinter product from Burracoppin, RLC proposes also investigating the potential for producing a saleable product without grinding but instead magnetically separating an iron rich concentrate after crushing the mineralised material. RLC expects if such a product can be produced using only crushing equipment (no grinding) and dry LIMS (low intensity magnetic separation) then CAPEX and OPEX for this product would be substantially less than for production of a premium sinter product. 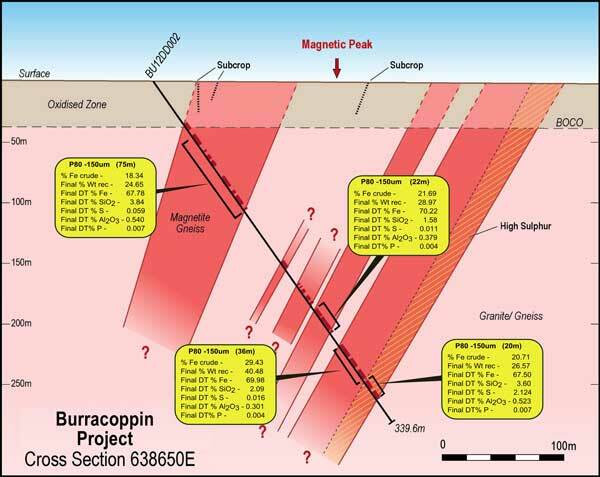 The next steps to advance the Burracoppin project will include additional drilling to determine whether a resource exists and to recover additional material for further metallurgical testing.